Tonight at 9PM EST/6PM PST, “JEK III Productions” presents a colossal “Pacman vs. Desert Storm” edition of “The Pugilist KOrner’s: Weekend Wrap”!! Throughout the first thirty minute segment of the two hour program, The Pugilist KOrner team will talk about this week’s dramatic plot line, featuring Sergey Kovalev, Adonis Stevenson, Al Haymon, Kathy Duva, Yvone Michel, and the brass at HBO. JK and Joseph will also discuss “The Krusher’s” dominant KO7 victory over the outgunned Cedric Agnew on last night’s HBO broadcast, and Adonis’s bold and somewhat confusing post-fight tweets. 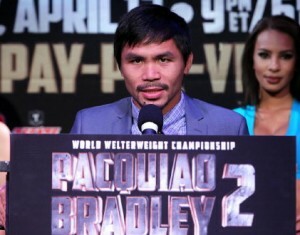 The dynamic duo of “The Pugilist KOrner” will also examine last night‘s episode of “Pacquiao vs. Bradley 24/7”, as well as the entire “Face Off” special between the two April 12th combatants. Did we learn anything new on last night’s episode, and what kind of PPV numbers should we expect on April 12th? At the half hour mark of the show, “The Pugilist KOrner’s: Weekend Wrap” is honored to feature elite level trainer Ronnie Shields!! The Houston, Texas based fight coach will talk about the upcoming May 2nd title fight between Erislandy Lara and Ishe Smith, slated to take place in Las Vegas, Nevada. The future Hall of Fame boxing mentor will also give us his assessment of Sergey Kovalev’s performance last night, as well as how he would fair against Super Middleweight kingpin Andre Ward. READ Could Kell Brook Do Any Better Against Terence Crawford Than Amir Khan Did? In the final segment of the evening, we’re proud to feature master strategist James Gogue on “The Pugilist KOrner‘s: Weekend Wrap”. The three decade boxing coach will examine the legal ramifications surrounding the entire Kovalev/Stevenson mess, and how it could affect the future plans of Showtime Sports and promoter Yvone Michel. The knowledgeable fight trainer will also technically break down what Adonis Stevenson saw during Sergey Kovalev’s title defense that prompted him to shoot out his abrasive tweets after last night’s broadcast. Gogue will also talk about why a weight ceiling will be a huge factor in the proposed July 19th meeting between Julio Cesar Chavez Jr. and Gennady Golovkin. Tonight’s program will be hosted by radio producer and commentator James E. King III, and boxing writer and ring announcer Joseph Herron. Tune in tonight at 9PM EST/6PM PST! !